How long it will take for a flower to growth? 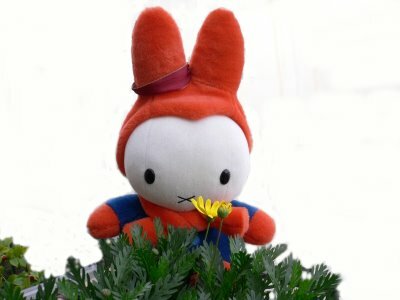 Spring is here, actually a week ago, so Mother bunny bought some nice flowers to adorn our garden. Miffu and me adore flowers and plants, but Miffu really doesn’t know that not all plants are good for little bunnies. This is the first time Miffu appears in my blog, but it will not be the last one. Having a little sister is a lot of fun but a lot of extra work for the bigger bunny. She was so excited when she saw the flowers that she jumped and got into the plants breaking some of them and eating some too. Hpam that stands for Hotel Puerta de America is according to them “ Much more than an hotel […] is an hotel made of the stuff dreams are made of : talent, inventiveness, madness, sanity.. a real dream come true. And yes, Miffa here it is the review old Father Bunny did after that long weekend in Madrid. I feel sad because you did not wanted to come, but really you did not miss a lot. I really booked a room in the 8th although I was advised over the phone “we can not assure u floor ability cause from time to time we need to close some of them for repair” – Oh men that really scared me . You must use your card to use the lift, security reasons… when the door opens one can admire the vortex (or so) lamp, nice, but be careful because you can severe damage yourself with it. And surely the bill will be huge. 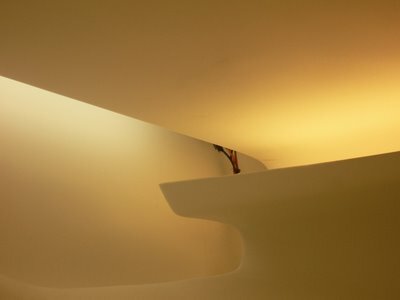 Everything is white (although you can choose black and orange too) this is nice as there’s plenty of light, but as the bell boy pointed, “ beware profile is not perceived well and many people hit their head with the ceiling or the walls” Thanks boy! 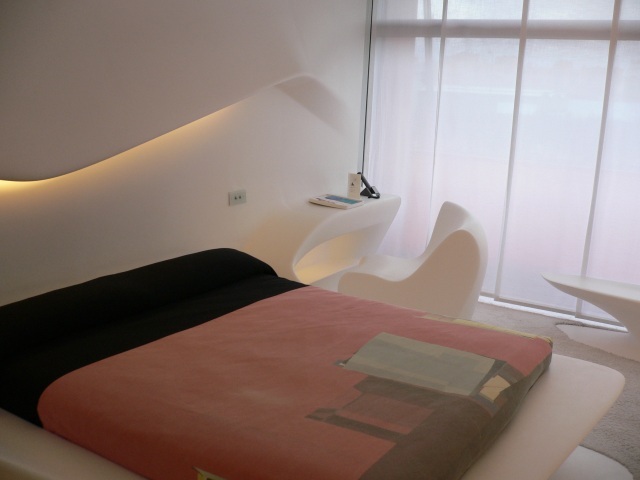 Bang and Olufsen Phones, Plasma TV, it’s not The Peninsula but is not bad at 180 euro per night. Ah, I forgot: a nice warning note informing you that if any was removed from the room the will charge you. Nice top terrace but anything you order is more than 6 euro. Spa, gym and pool. Just ridiculous for a 5 star hotel. Top floor again, designers place men and women sign on black over black doors, so no one founded the right place. No problem a nice piece of paper and that it. “le finition” – yes Miffa I don’t speak French but you don’t too so stop teasing me- You can check out the picture. Abosutel no words.. Pity of the poor room assistants than clean the room, it’s impossible not to convert the bathroom in a real pool. Yes Miffa, there were some good thing too, but they pretend me to charge me 6 euro an hour to use Wi-Fi. As you know I was dating for sometime with Cutnejo and I still do but some people every single time noticed some differences between me and him. I’m almost three times bigger than him and while I’m kind of rounded bunny he is kind of cutting edge one. Unfortunately legal stuff and poor ability to produce origami figures delayed several times our aim to release a CutMiffa. But a Japanese artist Kei Craft made this work, that I founded at Paper Kraft. 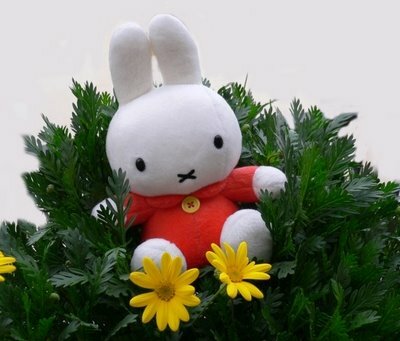 According to this blog he was commissioned by Asahi.com […] Japan likes cute and cuddly animal characters like Miffy and Miffa. Here they are CutMiffa & Cutnejo with a lousy picture of them pretending to be in Maldives. Please Father Bunny my fans claim for more quality. 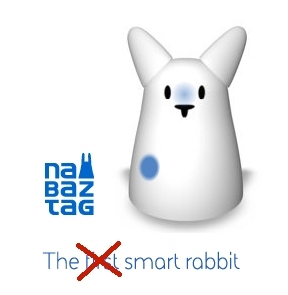 A colleague of Father Bunny, called Alex Rabbit, send him an email about a new smart bunny called Nabztag. “ May be a good companion for Miffa” said him. 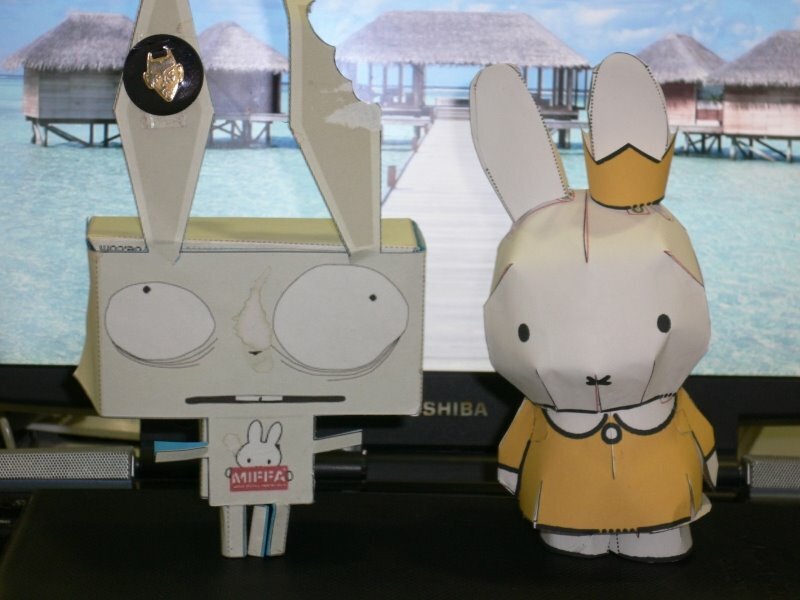 Would you take your plastic wi-fi bunny with you in a 9000 km trip inside rural China, and would you sleep with in a night train as Father Bunny and me did???? Me, Miffy and my cousin have no limits and him does!